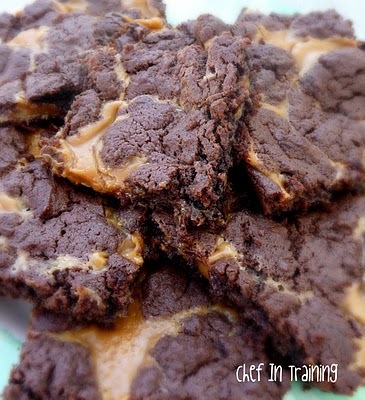 I saw this recipe from Yesterday on Tuesday and decided it was in my sweet tooth’s best interest to make them! I mean, how could I resist chocolate and caramel right?! In a heavy saucepan, combine caramels and 1/3 cup of evaporated milk. Cook over low heat, stirring constantly until smooth; set aside. In a large bowl, stir together the cake mix, melted butter and 1/3 cup of evaporated milk by hand until dough holds together. Press half of the dough into the prepared pan, reserving the rest. Bake for 10 minutes in the preheated oven. Remove from the oven and sprinkle the chocolate chips over the crust, pour the caramel mixture evenly over the chips. Crumble the remaining dough over the caramel layer and return to the oven. Bake for an additional 15 to 18 minutes in the preheated oven. Cool in refrigerator to set the caramel before cutting into bars. I sure wish I had caramels and I would for sure whip some of these up!! Right now at DQ is a Ooey Gooey Caramel Brownie Blizzard...you could use these to mix in and make your own at home!! Hi Nikki,I have some good news for you - you have been awarded the Versatile Blogger Award! I so enjoy your blog. YOU deserve it. You can find out more by going to: http://projectqueen.org/category/ramblings/the-versatile-blogger-award. Have a great day! I make these same bars, and they are so good! Even my husband who isn't really a chocolate fan loves these! Yours look perfect! Oh, I've made these before! Yum! I put in too much butter (two sticks instead of 1.5? ), but it still turned out okay. They were a Christmas present for my sister. Oh man... I've been resisting the urge to come check these out since you posted this. Your pics are very problematic for me, ya know... thanks for the good idea! This is one of my favorite recipes ever! I use devil's food cake mix for mine so they're nice and chocolatey. You had me at Ooey Gooey....and maybe caramel...okay brownies too ;) Thank you for sharing. I cannot wait to make these! This is a favorite recipe of mine...I'd totally forgotten about it! Will have to put it back in my dessert rotation! Thanks so much for dropping by and sharing at the Tuesday To Do Party! Caramel and Oreo based desserts are among my very favorites, so your link-ups this week struck a very sweet note indeed! omg I've just found your website and in love! (with it, not you but don't take it personally lmao!) you are now top of my blog roll! Can't wait to make these!! I have a question though, you say to use cake mix, is this instead of brownie mix? Just want to double check so I can buy the right ingredients!